That’s supposed to be a Messerschmitt hunting our heroes. Close, for 1942, I suppose. 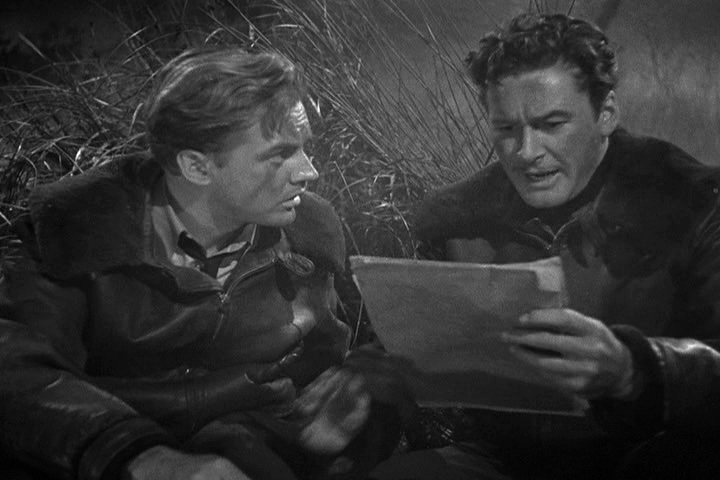 Errol Flynn and Ronald Reagan star in this war-time romp through propaganda film camp. 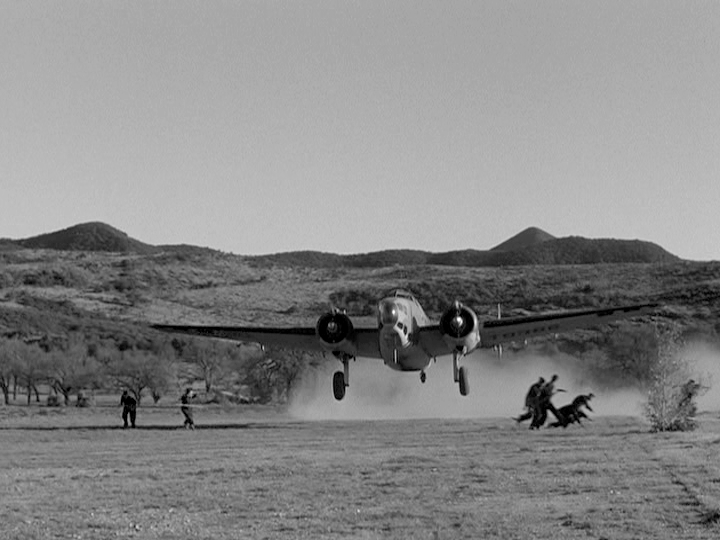 Directed by Raoul Walsh and released in 1942, Desperate Journey was designed to raise morale and lift spirits. Now I’m not one to discount a film because its chiefly a propaganda film or a morale booster, or even if its an enlistment tool. Propaganda is a historical reality and its as old as the states and nations that employ it. 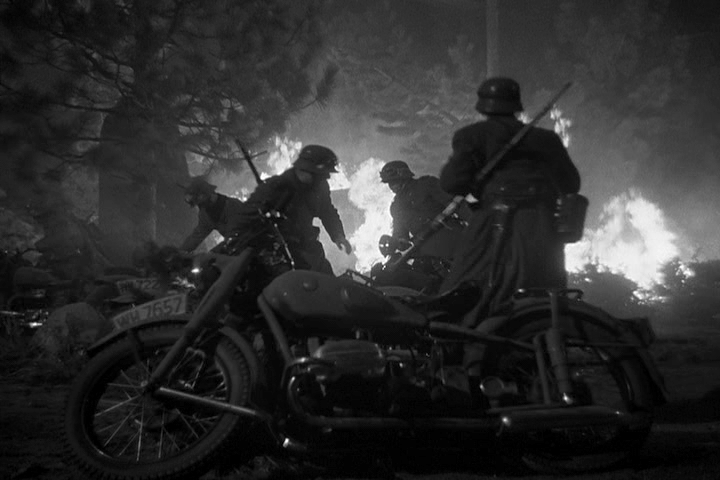 This film is truly a wartime piece of typical western propaganda. It paints the Allies as fearless, chipper and brave men of daring-do, while painting the Germans as hapless Teutonic oafs and incompetent simpletons. It is a fun film. It would make an appropriate film for children as well, if they just need a war movie to view. My little boy loves war movies, just like I did when I was his age. The fanciful interior of the B-17C looks very much like a period aircraft, but not too much like a real B-17. 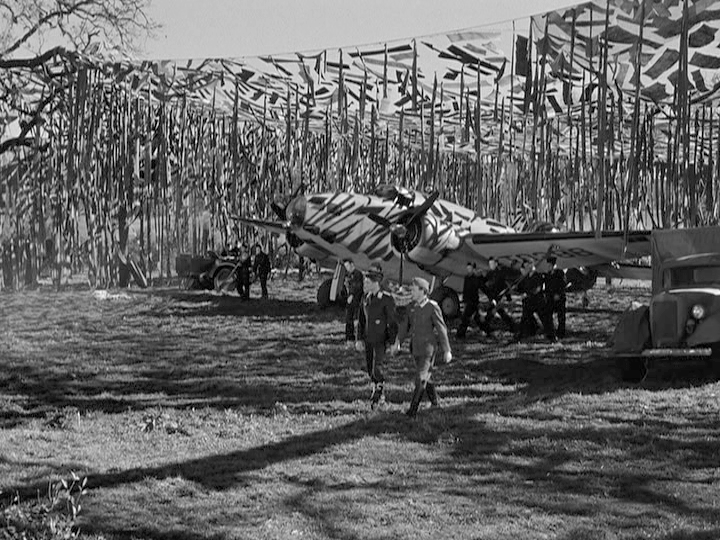 The film’s war-time production is very evident. There are efforts to have the production look and feel accurate, but clearly a lack of reference material has consequences. After all, the production crew couldn’t run down to the local aviation museum to look at a Bf-109 or download 3-views off the ‘net. 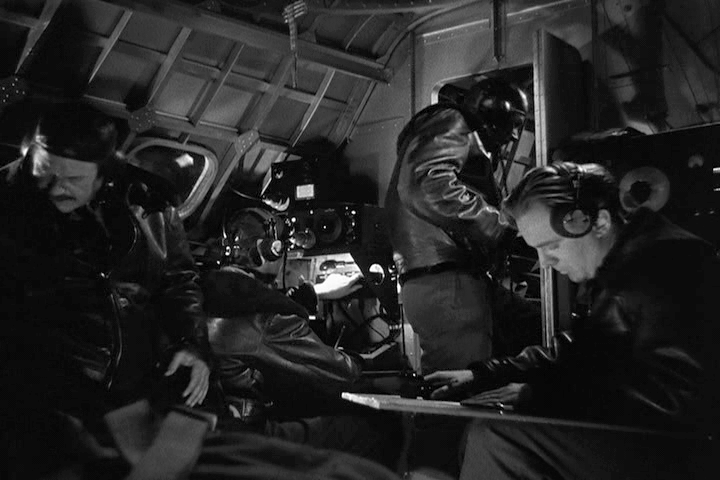 The interior of the allied aircraft is fanciful as well, probably as an effort to obscure it from the enemy. That said, its far more realistic in its general impression than even some later aviation films could pull off. Our heroes discover vital war info carried on dead Germans. 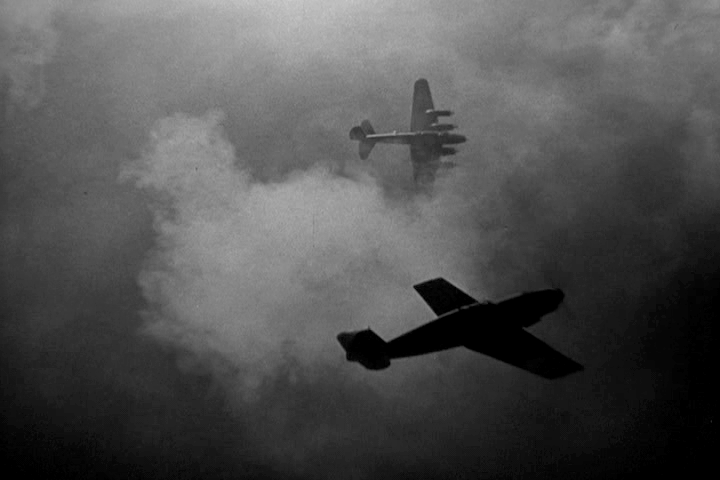 The outlandish plot follows a mixed aircrew of lovable characters as they man an early Royal Air Force Fortress I (or Boeing B-17C to us Americans) on a dangerous mission deep into Germany to destroy a rail junction. They take on this suicide mission with devotion and bravado, and like good allied heroes, they joke about it in the face of danger. Characters are typically devoted to the cause, including the older fellow who had to lie about his age – he served in WWI. Some nice cinematography and good compositions make up for a lack of modern special effects. Inevitably, the crew get shot down by the Germans deep behind lines, and begin their over-land trek back to England. With each challenge our heroes rarely lose hope, they are dutifully self-sacrificing, and they keep cutting up in good spirits all the way. 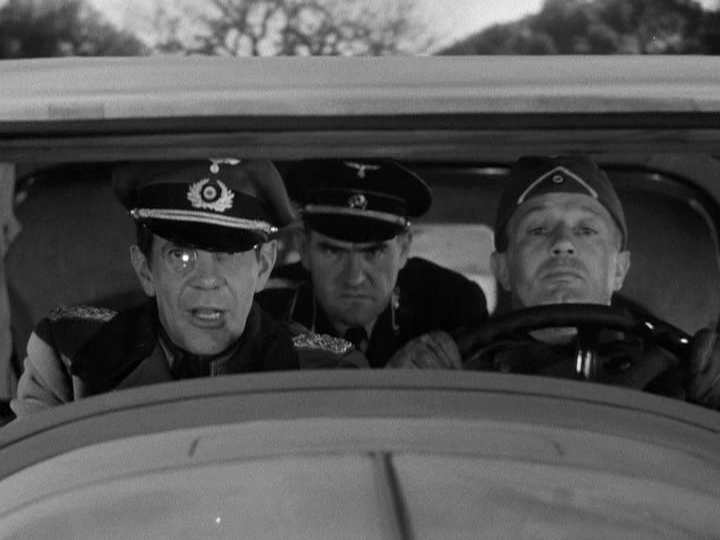 The men are duty-bound to add secondary missions to their escape, as all good allied men ought to, right? They are witty and wise-cracking, even treating their Nazi captors like school-teachers, spitting seeds on them and luring them into impromptu traps like gullible oafs. The producers paint the Nazis in very poor light, which, while they were evil and worthy of ridicule and mockery, they were not stupid fools. But in the end, the movie is a light and entertaining adventure in the classic way, and I enjoyed it. 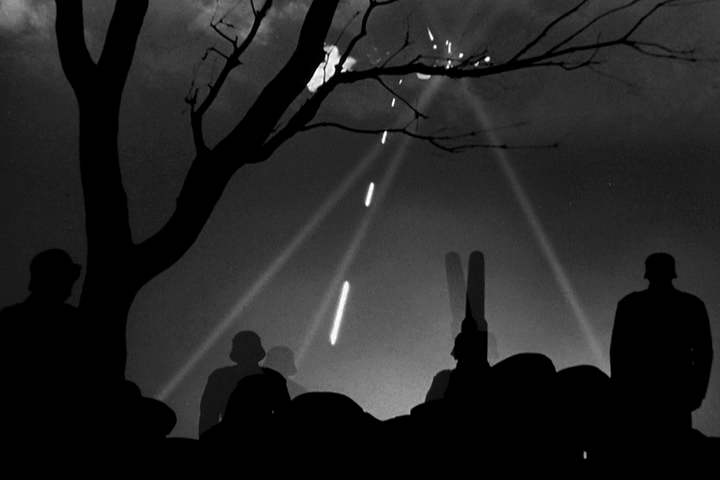 Germans with long Mausers in a dramatic back-lit scene. If you are into weird and unusual interpretations of German aircraft, and who isn’t, this film is for you. The interpretation of fuzzy photos of Axis aircraft are close… sort of, in shape to the real deal. Clearly the allies had not yet had close looks at the real deal. The Stuka is almost laughable. To a post-war mind used to seeing perfect renditions of enemy aircraft down to the correct number of rivets, these are some startlingly poor replicas. Given the year of production, they get a pass. Likewise, the Germans carry Mausers, but they are WWI-era long Mausers rather than the carbine-length K98s issued during the war. Still, at least they are Mausers. 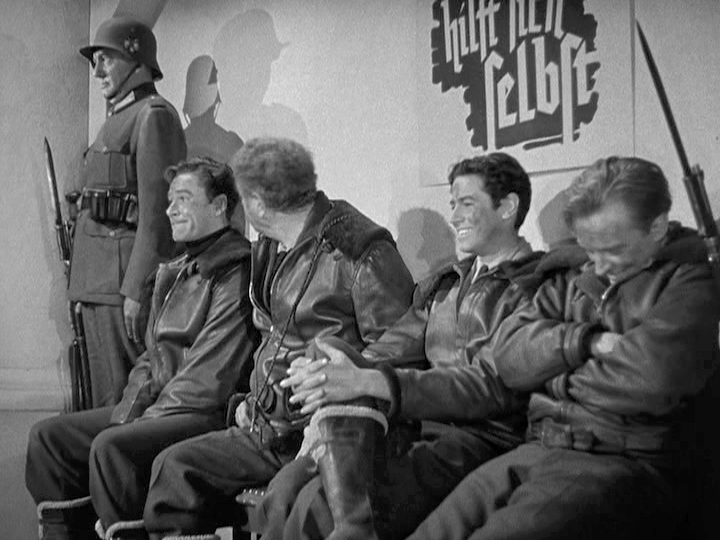 Good ol’ allied fighters – cutting up like schoolboys outside the principal’s office. As propaganda, you will see stereotypes as well. The German commander dons his requisite monocle like all evil villains ought, and somehow the British can’t be allowed to do heroics without the Americans, so some odd circumstance is conjured up for Ronald Reagan to play a leading role. A German nemesis needs a monocle and an overcoat. I enjoyed the film despite its campy nature and its technical flaws. It is fast paced enough to keep the viewer interested and has some twists and turns that move the tale along. In all, its a good time and an adventure. Have at it. We’ll just steal back a captured allied plane that happened to be in the right spot at the right time. Fun film, despite it all.